NASA’s New Horizons has successfully reached Ultima Thule, a distant and small world far beyond the orbit of Neptune, at the edge of the Solar System. 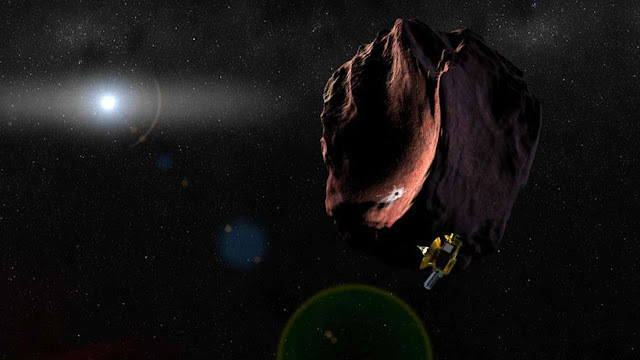 After its successful flyby of Pluto in 2015, the interplanetary space probe maneuvered to reach a second object, an island-sized rock floating in the Kuiper Belt. Ultima Thule is the nickname of 2014 MU69, a 30-kilometer-wide (20-mile) object, discovered in 2014 when researchers were looking for potential targets for New Horizons’ post-Pluto exploration. Given that New Horizons was launched in 2006, this will be the first exploration of a world unknown at the time of launch. But this is not the only first for the mission. In the weeks leading up to this historic flyby, the team looked for potential rings or moonlets but found none. This allowed them to put New Horizons on its closest possible path near the object, flying at 14 kilometers per seconds (32,000 miles per hour) just 3,500 kilometers (2,200 miles) from the surface. Ultima Thule is currently 6.49 billion kilometers (4.03 billion miles) from the Sun. We have never taken a close-up look at something this far away before. New Horizons reached Ultima Thule at around 12:33 am EST (5:33 am GMT) January 1, 2019. NASA received confirmation of a successful pass at 10:32 am EST. Over the next few days, data from the observation will come pouring in. The suite of instruments have been tasked to understand the geology, morphology, and composition of this distant world. Photos, temperature measurements, and chemical analysis will be studied in detail by the New Horizons team. The goal is to understand how Ultima Thule came to be. The team estimates that it will take 20 months to download everything the probe will collect in its brief flyby. Extending from just beyond the orbit of Neptune to up to 18 billion kilometers (11 billion miles), the Kuiper Belt is home to dwarf planets like Eris and Makemake, as well as many smaller objects like Ultima Thule. Understanding its formation will help scientists understand how other objects in the Kuiper Belt formed and even gain more insights in the early years of the Solar System. This incredible achievement is truly an awesome way to start the year.